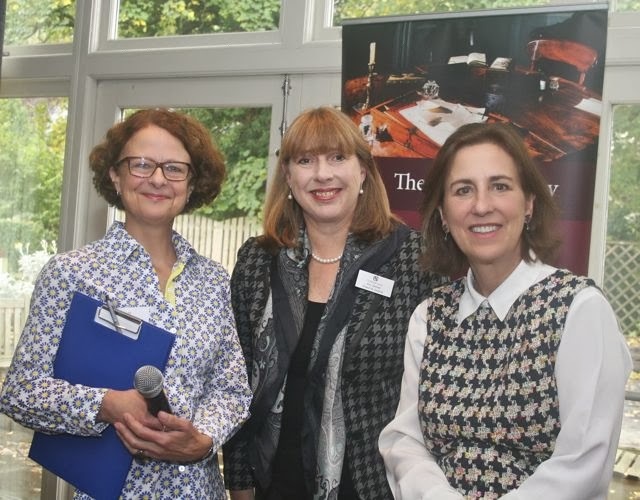 A familiar face for most of her audience, which was sitting around tables in the long restaurant room of the Wheatley Arms in Ilkley, Kirsty Wark spoke engagingly – of course – about the books which have influenced her since her early days and which she can not live without. For the enlightenment of non-British readers of this blog, Kirsty Wark is best known as the long-term female presenter of the nightly BBC current affairs programme Newsnight. She has also hosted the weekly Arts and Cultural review and comment show, The Review Show, and has interviewed a long list of famous and infamous people. On this occasion, she was interviewed by the accomplished Ruth Pitt, a television veteran who knew exactly which buttons to press. After a message from Chair of Brontë Society Council Sally Macdonald, who was unable to be present, and which included a tribute to Bob Barnard, Kirsty Wark revealed that she had entered the game herself as a novelist, with The Legacy of Elizabeth Pringle, described as ‘a multi-generational story of love and belonging set on the Scottish island of Arran’ after fielding jokey comments about her second place in a Celebrity Masterchef series. “I used a different part of my brain I didn’t know I had,” she told us. “The power of research is very important. There was a prosaic start to the whole business. I had the bones of an idea when I was on Arran a long time ago, then picked up the threads years later… I don’t work quickly…and it is exhilarating to work with an editor. She calls what she does ‘invisible mending’" The novel will be launched in March 2014, but can be ordered now. The first book she picked was a poetry book for reading out loud published in 1957 which contains Boats sail on the rivers by Christina Rossetti, and the second was The Rattlebag, the poetry anthology put together by Ted Hughes and Seamus Heaney. “I just adore Seamus Heaney – a wonderful man – humane and sympathetic.” She has interviewed him, naturally. Sylvia Townsend Warner’s 1920s satirical novel Lolly Willowes, about a woman who moves out of town to escape her appalling relatives and who becomes a witch, is greatly admired, by herself (and by Donna Tartt, whom she has recently interviewed) because it is “about the otherness of women” and it was at this point that she broke off to speak about “the new misogyny”, quoting Germaine Greer, who thinks that “we are in danger of losing all the gains made” for women. She was appalled (in tune with everybody in the room, probably) by the “extraordinary fuss” and the vicious comments from some which had accompanied the putting of Jane Austen’s head on a banknote. The theme of displacement came next, and we were told about No Great Mischief by Alistair McCloud, the title being a phrase from a statement by General Wolfe, famous for the storming of the heights of Abraham at Quebec, who describes the members of the MacDonald clan who fought under his command by writing in a letter, "They are hardy, intrepid, accustomed to a rough country, and no great mischief if they fall." It is mainly about leaving home and the old country, which links with her own family history. We got to Wuthering Heights in the end. She has read it to her children: horrified by Heathcliff, they thought that the character had no redeeming features at all and that the novel is full of cruelty. Perceptive children. She elaborated on the theme of landscape-based writing and on timeless relationships (“Everybody makes bad choices sometimes…”) and said that she disliked the film directed by Andrea Arnold. Kirsty Wark was definitely a popular choice of speaker, warmly received, as they say, and much commented upon afterwards. Plenty of people could be seen jotting down the titles. She went on to be interviewed by Ann Sumner at an event organised by the Ilkley Literature Festival at the King's Hall, before driving back to Glasgow.